Ten Speed Press, 9781607747345, 224pp. From the acclaimed chef and owner of Brooklyn Delhi, a debut cookbook focused on the celebrated vegetarian fare of South India. From the classic savory crepe dosa, filled with lemony turmeric potatoes and cilantro coconut chutney, to new creations like coconut polenta topped with spring vegetables 'upma" and homemade yogurt, the recipes in Vibrant India are simple to prepare and a true celebration of color and flavor on a plate. Chitra weaves together the historical context behind the region’s cuisine and how she brought some of these age-old traditions to life thousands of miles away in Brooklyn during the city’s exciting food renaissance. Relying on her experience as a culinary instructor, Chitra introduces the essential Indian cooking techniques, tips, and ingredients you’ll need to prepare a full range of recipes from quick vegetable stir frys (corn, basil, and leeks flavored with butter, cumin, and black pepper), salads (citrus red cabbage and fennel slaw with black mustard seeds, curry leaves, and chile), yogurt raitas (shredded beets and coconut in yogurt), and chutneys and pickles (preserved Meyer lemon in chile brine) to hearty stews (aromatic black eyed peas, lentils, and greens), coconut curries (summer squash in an herby coconut yogurt sauce), and fragrant rice dishes (lime dill rice with pistachios). Rounding out the book is an array of addictive snacks (popcorn topped with curry leaf butter), creative desserts (banana, coconut, and cardamom ice cream), and refreshing drinks (chile watermelon juice with mint). Chitra provides numerous substitutions to accommodate produce seasonality, ingredient availability, and personal tastes. The majority of recipes are gluten-free and vegan or can be easily modified to adhere to those dietary restrictions. 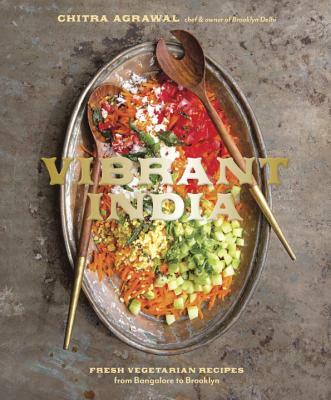 Whether you are a vegetarian or just looking for ways to incorporate more vegetarian recipes into your repertoire, Vibrant India is a practical guide for bringing delicious Indian home cooking to your table on a regular basis. Chitra Agrawal is the author of Vibrant India: Fresh Vegetarian Recipes from Bangalore to Brooklyn and the founder of Brooklyn Delhi, an award-winning Indian condiments line. Since 2009, she has been serving, writing about, and teaching her family's vegetarian recipes from India with a slant on seasonality and local ingredients. Chitra writes the popular recipe blog The ABCDs of Cooking, teaches vegetarian Indian cooking classes at Brooklyn Kitchen, Brooklyn Brainery, and Whole Foods, and hosts pop-up dinners throughout New York City with creative Indian-inspired menus. Her work has been featured in The New York Times, Food & Wine, Saveur, and Zagat, among others. She lives in Brooklyn, NY. "... Agrawal offers page after page of hits with dishes such as steamed lentil and herbed dumplings, root-vegetable and Asian-pear salad, stir-fried corn with basil and leeks, and the must-try cardamom oatmeal cookies with dark chocolate and raisins. ... There’s enough variety in this superb debut to please Indian-cuisine newbies and veterans, and Agrawal’s dishes are hearty and flavorful enough to please even the toughest carnivore at the table."